I can't say enough that I think Pat Burrell should have been the Phillies left fielder again next season. He added a potent threat to pitchers that had to pitch around Ryan Howard and he fit in as a Phillies player for many years. Burrell wasn't fully respected in Philly though, his numbers were great but no one really brought up numbers, for some reason Pat's star dimmed in Philly. Was he Babe Ruth? No, not really but the Phillies thought enough of him to make him a very highly paid ballplayer in the past couple of years. The Phillies not only gave up Burrell, when they added Raul Ibanez, but now the Phillies will be giving up their first round pick at #28 plus added to the fact the Mariners didn't even want to go beyond one year with Ibanez which made him available to the free agent market. Raul is 36 years old, an age when most offense hitters really start to decline for the most part. Does the Phillies brass know something that we don't about Ibanez for the next three seasons worth of production? If anything we needed a young stud out there in left, not an aging guy like Ibanez. He got the deal in my opinion for one reason, Pat Gillick. Pat's hands are all over this one. Gillick made no bones about that he was out to get rid of Burrell. If Ibanez can return to his 2006 stats of 33 HR's and 123 RBI's this deal will look like gold, if Ibanez gets hurt because of his age, or hits less than 20 HR's and lower than 100 RBI's this deal could look as bad as the Garcia and Eaton signings by Gillick. The majority of this team was in place by 2004 with Ed Wade, with some tinkering it became the championship team of last year. With Burrell gone now, the landscape has changed to a less fertile field. I am a Jamie Moyer fan. He goes to the ballpark to win, he signs autographs, he's a family man, and he singlehandedly dug up the pitchers mound and took it home after the Phillies won the World Series in 2008! How can't you like a guy like that? 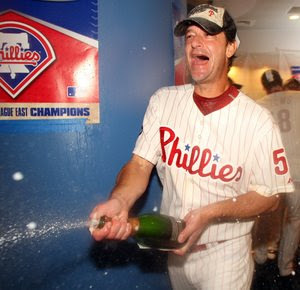 Jamie Moyer had a career year last year, he almost beat Cole Hamels out for the top pitcher on the team. He had the most wins of any Phillies pitcher last year with 16. This could be the pinnacle of Jamie's career last year. Jamie was born in 1962 and made his major league debut in 1986. He is 46 years old now, and yes he had a great couple years with the Phillies. When he broke in with the Cubs he made $60,000 in 1986, last year he made $6 million pitching for the Phillies, the year before he made $6.5 million. During the years from 1998 through 2008, Jamie has made 62.8 million dollars from his pitching career according to Baseball Reference.com. Not too shabby. You can buy a co-op in Queens for that kind of money and still have a few million to play around with at the end of the day. During the season Jamie pitched really well, he logged 196 innings for the team and amassed all those wins. In the playoffs, it was a different story. Jamie got absolutely blown off the mound against the Dodgers in a nightmarish game for him. I thought I saw Jamie's last pitching as a Phillies player that game. Not that one game tells a story, but Jamie had gotten away with that 78 mile pitch all year, but now it seemed like everyone was on to him. He couldn't buy an out if he wanted to. I was surprised that Jamie started a World Series game, I really was, the Dodgers had nearly torn him apart in the NLCS, and his 40.50 era proved it. It was perhaps the worst start by any Phillies pitcher in the playoffs in recent history. He did get that World Series start in Game 3 and he caught the young Rays off guard, he pitched 6.1 innings and scattered 5 hits with 5 strikeouts with 3 ER in a no decision for him, but the Phillies went on to win the game with a run in the bottom of the 9th inning and win 5-4. My point is Jamie Moyer trying to be too cute? He's 46 now and if the Phillies offer a two year $15 - 16 million dollar deal, if I were him I would grab the nearest pen and start signing my name to the contract. He's not a guy who's going to command $10-12 million a year for two years let's face the facts. If fact, if the last two outings Jamie had were any indication of what is to come from him, who ever signs him could be in trouble. The Dodger game told a big story, Jamie can't hide from it. He's got a 83 mph fastball on a good day and it really seemed like it could have been all over for him in LA just a couple months ago. Time will tell if Jamie rejoins the team, I would think he would want to end his career here, and no matter what happens to him in 2009, Phillies fans will always remember his stellar year in '08 - but that LA game still haunts me. Jamie do the right thing and sign your name, real soon! 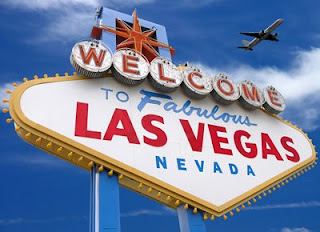 The Phillies are looking for help from the Bellagio Hotel in Las Vegas for the Winter Meetings. God, what a beautiful hotel the Bellagio is! I wish I was out there! The Phillies may have won the 2008 World Series, but don't tell that to the odds makers in the Las Vegas casino sports books who have put the Phillies in not as a favorite to repeat, but at odds of 10-1. The serious odds again are with the Chicago Cubs and the Boston Red Sox to get into the big game for 2009 and win. Even the Mets have been given better odds to make the win the series in 2009 at 8-1. So once again, the Phillies will start off the season next year with being the underdog. Even the young Rays team has better odds to return as of now at 8-1. The Phillies haven't made any moves yet this offseason that will improve their odds, but don't they won't. 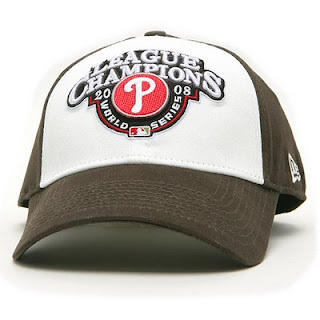 Buy them now at 10-1 and you'll be ahead of the game when the Phillies return to the World Series and win it all again! Ruben Amaro has a cushion, he is currently the GM of the Philadelphia Phillies the team that won the World Series last year. The moves he's made so far: not too much to write home about. He basically just snubbed Jamie Moyer and Pat Burrell to leave them in limbo for next season as far as solidly making them part of the 2009 team. In the newspapers, he seems like he's doing the right thing. "I don't want them getting a raise on my account" is what he is saying though. Just because they had such a great season. Other quotes has him just glossing over these two players, theorizing who could be out in leftfield, or who would take Jamie Moyer's spot in the rotation. That's gratitude, the 'new style' exuded from the front office. What have you done for me lately. Certain publications won't go out and say this, because for one reason or another they don't want to really say the truth, but I will! Amaro is the Grinch! Phillies don't offer arbitration - maybe due to last year? This is the Philly Style that Pat brings to this ballclub! The Phillies did not want Jamie Moyer and Pat Burrell to take them to the cleaners legally through the arbitration channel next year that is. Both players had a great season and given what happened to the Phillies last year with Ryan Howard getting a big surprise with a 10 million dollar salary for the year made the Phillies shy away from the table this time around. Burrell is ranked as the 31st best outfielder in CBS Sportsline 2009 Fantasy rankings, they say he is streaky. The Phillies never really were a contender for Matt Holliday, he is ranked #1 by the CBS Sportsline '09 ranking. The Phillies now seem content with putting just about anyone out in left field next year, and it probably won't be Mr. Pat Burrell at any price. Again I ask why? Pat has got the Philadelphia attitude of winning down 'Pat' he doesn't complain and he understands what it takes to win and contributed to the Phillies post season wins really well last season. How about some loyalty by the Phillies, Pat is a lifelong Phillie, if anyone deserves some payback from the team it would be to him in my opinion. Moyer: he is probably in the last year of his pitching career next year he is worth the money you give him just in experience to the other pitchers and he is one of the only players that signs autographs before the games that I've ever seen. In this day of the millionare stuckup ballplayer, he is a real gentleman. I don't mind paying to see a ballgame when I see the class that Jamie Moyer exudes everyday. NEW YORK -- A full World Series share was worth $351,504 for the Philadelphia Phillies, below the record $362,173 set by the St. Louis Cardinals two years ago. Major League Baseball said Tuesday that the players' pool for the postseason was $51.16 million, down from $52.46 million last year and a record $55.60 million in 2006. Phillies players received $18.42 million and split it among 45 full shares, 7.039 partial shares and 15 cash awards. Last year, a full share on the World Series champion Boston Red Sox was worth $308,236, with players awarded 47 full shares, 14 partial shares and 11 cash awards. Not too bad for the guys who didn't earn the millions like some of the Phillies players! Even the staff got in on the awards. Major League Baseball is full of confusing terms and the way they do their daily business is just as confusing. Here's a primer on the Rule 5 Draft and what it is exactly. The Rule 5 draft is a Major League Baseball player draft that occurs each year in December, at the annual Winter Meeting of general managers. The Rule 5 draft aims to prevent teams from stockpiling too many young players on their minor league affiliate teams when other teams would be willing to have them play in the majors. The Rule 5 Draft is named for its place in the Professional BaseballCollective Bargaining Agreement. The June Rule 4 draft, known as simply "the draft" or the "amateur draft", is a distinctly different process in which teams select high school and college players. To prevent excessive turnover in the minor league levels, each draftee costs $50,000. If the draftee does not stay on the selecting team's 25-man (major league) roster all season, the player must be offered back to his original team at half-price. Organizations may also draft players from AA or lower to play for their AAA affiliates (for $12,000) and may draft players from A teams or lower to play for their AA affiliates (for $4,000). The Rule 5 draft has opened opportunities for teams to take other team's top prospects who may not be ready for the major leagues. A prominent recent example is Johan Santana, who was chosen in the 1999 Rule 5 draft by the Florida Marlins when the Houston Astrosdeclined to put him on their 40-man roster. After the Marlins traded Santana to the Minnesota Twins for minor leaguer Jared Camp, the Twins kept him on their roster for the 2000 season, despite the pitcher's subpar performance that season (6.49 earned run average) which was unsurprising given his youth and inexperience. Having kept Santana in the major leagues for all of the 2000 season, the Twins subsequently had the right to option him to their minor league system. By 2002, the more fully developed Santana had returned to the major leagues and established himself as an above-average pitcher. From 2004 to the present, Santana has been considered by many to be the best pitcher in baseball, winning two Cy Young awards. Had he not been chosen in the Rule 5 draft, Santana likely would not have made his major league debut until the 2001 or the 2002 season with the Astros. So that is a little bit of info on this draft and what it is for, there are exclusions to the draft as well. Read all about it at wikipedia here. The Phillies have been reported to have interest in a couple pitchers, A.J. Burnett and Derek Lowe. How deep is the interest? That is a good question. One pitcher that may be available as well is the old Phillies pitcher, Randy Wolf who just finished last season with the Houston Astros. Wolf pitched for the Houston Astros last season coming over from the Padres and did really well for them going 6-2 in 12 starts for the 'Stros with a 3.57 era. He finished 2008 with a 12-12 record. Houston is interested in Wolf, but as of yet, no ink is dry on his deal so he is still a free agent. Wolf is trying to get a better deal than Houston is willing to offer. Should the Phillies be interested in Wolf? Chase Utley was rumored to be hurt about a third to the end of the season. He never winced too much during that time but the rumor was he was hurt and just this afternoon ESPN Radio 950 in Philly put out a text message with knowledge that Utley will need a hip operation and need 5-6 months to heal. New Poll; Should the Phillies resign Pat Burrell ? 2009's Leftfielder for the Philadelphia Phillies? What do you see in this comparison, Burrell's numbers, if continued, may equal Schmidt's if he stays healthy and can play another 9 years. I consider Schmidt to be the greatest Phillies player that I have ever seen outside of Pete Rose, who played just a short time for the Phillies. Schmidt took it on the chin from the Phillies fans and so does Burrell, they have a lot in common. Schmidt is in the Hall of Fame for Baseball though and Burrell is still working toward that goal. The World Series buzz is just under a month old, but already there is speculation that the Phillies new GM isn't in any hurry to acquire any free agents that would make the Phillies instant '09 contenders for a repeat. Just by following the recent press interviews, it seems as if Amaro is taking the 'company line' in all negotiations. That is not saying anything about who the Phillies may or may not be after in the free agent market. Amaro is in some ways a step back for Phillies fans who wanted a really experienced GM that is his own man, and not one who simply follows orders from the owners. Amaro said he thought Jenkins could rebound in 2009. "Absolutely," he said. "I think more than anything else he was getting adjusted to a new team. This was a guy that had played for one club for 10 years. He was making an adjustment to being in a new environment, probably trying to make an impression and do a lot of different things. Maybe it got him out of kilter, but we believe he can come back and be a productive offensive player." These type of comments worry me. Look at Jenkins numbers, and his age. He's not a prime time every day player anymore in my opinion and to keep juggling Jason Werth is a crime. He should be the everyday player, he's earned the right. So the days march on to the start of 2009's opening day. Amaro continues to sound like a dud to me, he doesn't have anything eloquent to say about anyone the Phillies are looking at and he sounds as if he is still playing the role of understudy instead of the World Series Champion Philadelphia Phillies GM. The only Phillies only podcast that is independently produced, rolls right on with the 2008 Season stats review. 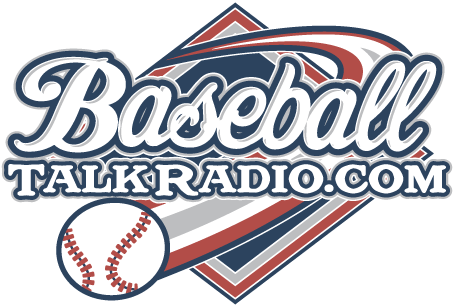 Join Rich Baxter on this internet broadcast as he talks about the stats that were compiled for the World Champion Philadelphia Phillies during the regular season. You can participate in this show and blog send your emails in, and you can call the show live when it is being simulcast over the internet all over the world! If anything was said to be recession proof it would have to be professional sports events. In the most terrible economic times this country has ever seen, ticket prices to see a baseball game will raise again for the 2009 Phillies. The biggest jump occurs to anyone wanting to sit from first to third base and buying the ticket as a single game. Prices also have creeped up everywhere else in the ballpark. Parking crept up to $11 during the last couple weeks of the season at the ballpark as well. The last 'affordable' sport to see a game just got pricier. The fact of having a World Series Championship team on the field doesn't hurt the Phillies front office at all with their quest for more money from the fans. 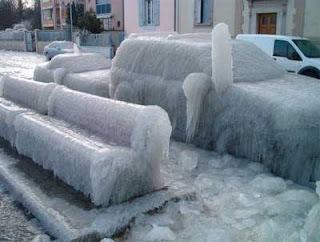 So you'll have to dig a little deeper for that ticket next year. It doesn't seem that long ago that a $22 ticket was top price at the Vet to see a game, but with the smaller venue at Citizens Bank Park, the reduced number of seats means that ticket prices have to spike up to amounts we didn't think we would spend on a baseball game just a few years ago. The ticket face value of World Series tickets this year in the better seating areas was $225 in 1983 you could have seen a World Series game at the Vet in the stadium for $25 in the outfield. Let's see if I made $20,000 in 1983, I should be making $200,000 a year now with that kind of math..... I am not mind you, inflation is a cruel reminder to all of us. Bench coach Jimmy Williams resigned without explanation the other day, a few people were at a loss to explain it. GM Ruben Amaro is just getting his first test on his position with only a couple days on the job. Now he must get two coaches, a third base coach and the bench coach. Can we read anything from Williams departure? He hasn't said anything publicly. Perhaps he is just yearning to move on. The Phillies 2009 season will kickoff on Sunday night at 8pm instead of Monday afternoon as originally announced. Opening Night will April 5, 2009 - vs. The Atlanta Braves. It will be the first telecast for ESPN Sunday Night baseball of the year. Scott Eyre signed a lucky deal in what he thought was probably his last year in the majors. He is said to be very happy, and who wouldn't be? The Phillies season should be fun to watch in 2009, now can we get another decent starter added to the rotation? Listen to this week's show here or download our show via iTunes! The Phillies came out to play this game to win tonight and they won it all with the victory tonight. It was a total team effort to win this game that started two days ago on a soggy Monday night and finishes with a sweet World Series victory. Series MVP was Cole Hamels.. he did wonderfully for the Phillies and he was just interviewed on tv and the announcer just reminded Cole that it was good he filed for arbitration this year! Cole stands to cash in on the arbitration deal for next season and he won a 2010 Chevy Camaro for his MVP status. All through the Phillies season though it was always changing who would come up big for the team on any particular night. They didn't steam roll over teams all year, they didn't win 100 + games this season but they are the World Champions as they put it all together when they had to, and when it counted. They played marvelously in the playoffs and knocked off their opponents like dominos. 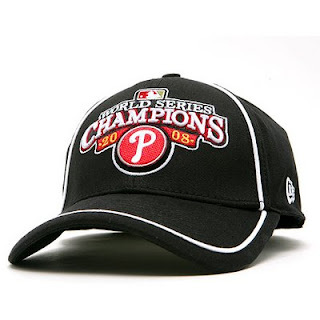 The Phillies championship in 2008 will last for years in Philly, this is what this area needed at these tough economic times and times of record high fuel prices and inflation. The team provided a much needed relief for a lot of people that had the Phillies to fall back on during these tough times. God bless the Phillies and good luck next year in 2009! A case for him to be the MVP of the series can be made from these numbers, Ryan has pulled it all together in the series and has been a catalyst of the team in the World Series. I have ragged him when he hasn't played good, but this guy is one of the reasons the Phillies are where they are now. Werth has proved he is the real deal in the series. The Phillies should know by now that he is an everyday player, as I've said before a couple times in this blog. Werth should be an everyday player in this league and playing for the Phillies. Carlos has been the surprise player of the series and the playoffs. We joked that he wasn't good enough to be playing this series before it started. Ruiz has the last laugh, we's right up there with Howard as the most productive player offensively. All of these stats are good through Game 4 - the series is still going on and we'll review all the stats of note after the series. Let the baseball gods let the Phillies win the World Series at home! We need a little to be happy about after that terrible delay of Game 5. The suspended game from Monday night will resume tonight in Philadelphia. I luckily sold my tickets to this game to give someone else the chance to experience the playoff atmosphere in Philly. I didn't want them to have to go through what these fans are going through though. The long ordeal of rain, wind and cold temperatures from Monday night is too much for any real fan of the game to have had to endure. I know from a few Sunday games we went to this past season with the storms that blew in from out of no where with rain and lightning and thunder. Rain poured down real fast in the summer and it sent a chill through out, the feeling from Monday must have been all of that and more. Tim McCarver has said that they should start Game 5 all over from the first inning. That isn't a bad idea, but it is one that will not happen. The MLB made their own agenda on this and they are sticking to it. The game simply should have never started with rain falling from the start of the game and the forecast being so bad within a short amount of time. That wasn't done either, so the suspended game stands and Jimmy Rollins gets an error for looking up into the sky on a routine fly which he couldn't even see due to the lights and the rain. The umpires in the game soldiering through this game found themselves making the wrong calls on pitches. All in all a bad situation, but the MLB won't start this game again from scratch, not a bad idea though and Tim McCarver had the gumption to say it. I won't tune into the game until 8:29 pm I will miss all the Barack Obama show on purpose... politics and baseball make strange bedfellows. The field was terrible for the whole game of Game 5 practically. The rumor had it that there would be no rain delays for this game at all, and that the game would go on no matter what. This is what happened until the moment the Rays scored the tying run in the top of the sixth. This game could have been called before they tied the game. It was incredible that MLB decided that at that specific moment to suspend this game at the time that they did. If anything, the decisions made by the MLB shed more light on the zaniness of this organization. Remember all the player drug scandals with regards to steroids? What do you hear of it now? Nothing. It that situation, there is a movement to make it appear as if nothing ever happened and all of this was swept under a big rug. This organization needs to be shuffled up and reorganized as, they are masters of assigning blame to other people when they are in fact the guilty party with regards to their own recent decisions. Phillies fans were happy when the team was leading, not too many wanted this game called and for them to win by default due to weather. The Rays tied the game, and then the game was called almost immediately. Something is wrong in this. Let the facts stand in this game, the MLB did wrong and this decision should stand as one of the worst ever made by a professional sports organization. Adding insult to injury, the country is bankrupt, we're in a war we can't win, the government has to bail out all the banks, there are record foreclosures across the country, and we go to elect a new President in only a week. God, we need a championship in Philly to boost our spirits! 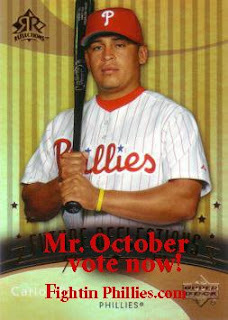 Is Carlos "Mr. October" ??? Last night's win over the Rays did two things for the Phillies, number one: It moved them that much closer to the World Series 2008 Championship and number two: it gave us a guy that could be "Mr. October" for the Phillies. That guy is Carlos Ruiz, an unlikely candidate for the position, but a player that has had key hits for the fightins throughout the playoffs. Only the die hard fans could last until almost 2 a.m. on Sunday morning for this one, and the MLB should be ashamed to have even played this game at all considering the weather conditions and the ticket prices that were charged to see this game. How could a kid stay up this late to see this game? The fact of the matter is that the weather was terrible leading up to even 9:15 pm, the rain doesn't just go away, it was there on the field and dangerous to the players who had to play in the sloppiness. I was landing at Philadelphia International airport at around 7 pm and it was the worst landing that I've ever experienced, it was so bad that everyone on the plane clapped and gave our pilots an ovation for getting that big jet on the ground as it swayed around like a helium balloon in the bad wind and rain as we hurled towards the landing approach in Philly. Even Fox television was having audio and technical problems with this kind of night. It wasn't right to have to continue on into the wee hours of the morning to get this game in, it shouldn't have been played. That is my opinion, but I am sure a lot of the fans there on this night feel the same way. You're paying premium money to see this game and it wasn't right! Phillies win in the late, late show 5-4, but if they would have lost I think a lot of sentiment would have been that the game just shouldn't have been played with those kinds of conditions. Tampa came back and played almost the same game the Phillies did in the first World Series game. That was get on the board and score early. The Phillies have had loads of chances to score runs in this series already but can't seem to put the puzzle together to do it. If you followed the Phillies all season, this is no surprise. They've had this issue before, they get men on base but can't score at times. A lot of the players on the team just don't seem comfortable in the big spotlight. Jimmy Rollins has been one of them. He's just not that happy go lucky type guy at times, it shows he's tense in the first two games. Perhaps the shift in the series to Philadelphia will do him justice and allow him to play his game. Ryan Howard did get on base a few times in Game 2 after his terrible performance in Game 1 where he struck out three times and got a walk. Ryan has yet to show us that power, and homerun prowess. He didn't have a home run yet this postseason and this is a concern. I didn't expect the Phillies to take game 2, the Rays are way to hungry to let that happen. Tampa has shown a will to win the whole season by taking the ALCS and even the Eastern AL division from the power stocked NY Yankees and Boston Red Sox. This team isn't a push over for sure. Down here in Tampa, I was listening to the ESPN local radio sports show called the Killer B's. They droned on and on yesterday about the fact that Clearwater, Florida which is where the Phillies train in the Spring, shouldn't be rooting for the Phillies at all and this was 'Rays Country'. They needed something to talk about and this was their topic for damn near the whole show. What a waste of radio time, they even had the mayor of Clearwater on the show and he said he supported the Phillies but at the same time he was rooting for the Rays. Fine, but these guys on ESPN radio belabored this subject and beat it to death like a dead horse. You can root for who you want to Killer B's whether you live just outside of the Tropicana Field and like the Phillies or you live in Center City Philly and like the Rays. This is what America is all about! The series shifts to Philly for three games now, it is even raining down here in normally sun drenched Florida, hopefully we can get the games in on time in Philly without too much of a problem due to weather. I think you see a different Phillies team for game 1 in Philly and a Phillies victory. The Phillies didn't lose a step last night in Game 1 in St. Petersburg, Florida for the first win in World Series history for the Phillies since 1993. Cole Hamels pitched a great game and the early offense by the Phils was good enough to carry the win in the land of the cowbell. Chase Utley came through in a big way and deposited a big home run into the right field seats to give the fightin's the lead early. The Phillies continued to get a lot of hits off of Tampa starter, Scott Kazmir, but they couldn't score any of them. They had an incredible 24 LOB in this game and they really shouldn't have won this game just based on that. The Phillies have done this all year, get runners on and then not score them. The combination of Rollins, Howard, and Coste left 14 players stranded on the bases between the three of them. Pitching was the key to this victory, because without the stellar performances by Cole Hamels, Ryan Madson, and Brad Lidge, the Phillies probably would have ended up losing this one. Ryan Howard got no respect from the Rays, and he ended up striking out 3 times and drew one walk. Ryan didn't look that good at all when he was flailing at balls as he's done against left handed pitching all season long. He'll come around possibly tonight with a right handed pitcher now going for the Rays in James Shields. The sold out crowd of over 40,000 in the Tropicana Field had little to cheer about except a home run by Carl Crawford. The Rays fans looked like they needed a rally towel instead of those terrible cowbells. I think a lot of the crowd noise is even drowned out by those cowbells, so they probably work against the notion that it is helping the team win. Phillies fans will be just plain loud when the series returns to Philly over the weekend. This victory silences a lot of the 'experts' that picked the Rays to win, they have to be double thinking their choice today, but this series is a best of seven series so the Phillies really haven't won anything other than Game 1 for now. The series will undoubtebly take a twist and turn here or there. My original pick was Phillies in 5, so that still looks good. We'll see tonight if Brett Myers can continue where Cole left off, and the Phillies offense can finally score some of those stranded runners if they have that many tonight. Silence the cowbells, it's World Series time! Down here in Tampa all the rage is about 'Cowbell Time', it's something a lot of fans bring to the games down here in Tampa Rays country. Every news story on tv mentions it, and the ringing of the cowbell is loud and under the dome stadium, it rings even louder. A lot of people don't like the constant ringing of these things, including sportscasters and visitors to the ballpark from the opposing team. The Tampa fans have barely been able to celebrate their ALCS victory and suddenly find themselves in Game 1 of the World Series tonight with their first ever appearance in such a game. The Rays team has got to be wanting a rest, and two days isn't long enough. The team does have youth but I don't think youth carries the day in this World Series. I don't understand why the Rays are even the favorite in the World Series in the first place other than the fact that nobody is giving the proper respect to the Phillies who are stocked with All Star caliber talent. Tonight will tell if the Phillies did have too much rest from last week's quick win over the LA Dodgers, I am glad they did win it so fast though, we could be playing Boston just as easily in the World Series Game 1 and I am happy the team is the Rays instead. The Rays aren't superhuman, they do lose and I think they lose Game 1 tonight in front of their hometown crowd. In late September, the Rays lost 3 of 4 to the Detroit Tigers. Detroit was terrible all year, but they handled the Rays just fine. Of course the Rays rested a few regulars but this shows that the Rays can be hit and scored on. The Rays also have produced average home run stats or below average for a team all year long. The Phillies have won a few postseason games just based on the home run. So look for the Phillies having the edge when they can go deep with home runs. Game 1 starter Scott Kazmir is average in the postseason he has an era over 4, he is young and the postseason jitters will turn into the World Series jitters as he takes the mound tonight. I think this is big for the Phillies. Your game 1 starter is 1-2 for the Rays and he is supposed to be the best on the team. The Phillies are stocked with All Star caliber players, Rollins and Howard have yet to show that they are the players that are trully 'All Star'. Look for them to have super stats in the World Series. Rollins did have a few key hits in the Dodgers series but look for him to have more in the W.S. and maybe become "Mr. October". Oh yes, I am so glad I am down here in Tampa, I am reading all the talk about Billy Penn's curse back in the Philly media, and I think all that is just a bunch of bull! Leave it to certain media to bring up the negatives. I don't believe in any of this, if anything the Phillies have played better than they ever have in the last month, let's celebrate that not the myths carried on by certain media outlets. I wore my Phillies jersey down here in Tampa today. I expected to talk baseball with people and my expectations weren't disappointed. The desk clerk was first as when we started talking baseball he told me the Rays barely attracted 20,000 people a night up to the All Star break and now everyone is a Rays fan. That is so true, both Florida teams seem to be that way. 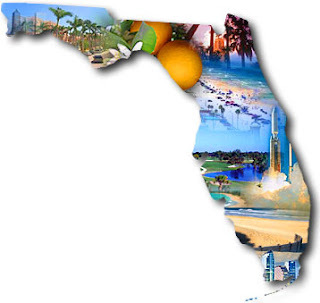 The whole season the hometown fans don't seem to support them, look at the Florida Marlins for instance, but if they make the playoffs and World Series the fans come crawling out of the wood work. Everywhere I went down here, I encountered people who were finally happy to see a guy with a Phillies shirt on! I heard that many times during the day, and most people were very polite when they didn't think much of my Phillies shirt or choice of team. I even went down to St.Petersburg to the stadium in a vain attempt to get tickets to Game 1 at the ticket window at the stadium. I was told there will be a sale of seats, and any remaining seats would go onsale at the Rays site if there were any left. The actual sale of the tickets will be on Tuesday with the game on Wednesday. I encountered some real die hard Rays fans waiting for the players to arrive, they treated myself and my Mrs. like one of their own, they knew we had come to get a glimpse of our heros from Philadelphia, just as they were waiting for their local Tampa heros. I also went to the Clearwater Bright House Network Phillies stadium where they have a gift shop that is open all year round, I looked at some nice branded hats with the World Series logo on them, and some nice shirts among other things. If you're coming down to the games, go there for your merchandise. It's all in a nice gift shop right at the stadium. The Phillies finally have themselves a World Series opponent. The Tampa Rays won an exciting game last night in which the loser went home and the winner goes onto the World Series. A tough pitching job there by Matt Garza last night for the Rays, this guy throws 96 mph fastballs the whole game so it seems so the Phillies will have their work cut out for them when they face him. The Phillies have had almost a week off now, they should be rested and ready to go on Wednesday night. Are they too rested? Probably. A week off to a professional athlete is like 3 months to you and me. The body takes a signal to relax, but that isn't a bad thing I am sure after six months of this long season, the Phillies have rested only as much to heal some of their minds that they are indeed in a battle for the World Series now. A lot of fans are going to make the trip down here for the first two games. I am down here in Tampa already but I don't have tickets and for the going rate that Stub Hub has them for, I think I will watch these games from my hotel flat screen. I will however rely what is happening down here in the news and generally from what I encounter. I would graciously accept two press passes for bloggers on the Phillies if anyone with some connections reads this and can arrange it! Just email me at Rich @ fightinphillies.com. Well today I am down in Tampa, not to see Game 7 but I am on vacation down here and I figured it was worth a post to tell you what is going on down here. Firstly, I was in Clearwater to see the Phillies Spring Training home, Bright House Field earlier today. The stadium looked great! A sign was on the light banners at the front entrance of the ballpark, "Go Phillies! World Series 2008" is what the signs read. That looked good, even though the stadium is closed at this time, just some cleaners were around the ballpark, cleaning the grounds and outside areas. I did get some photos and I'll be able to post them next week sometime on the blog here. Well, Tampa is abuzz with baseball that is for sure. The Rays have crumbled their big lead in their ALCS Championship and now the Red Sox have forced the Game 7 for all the marbles tonight from Tropicana Field in St. Petersburg. The game is currently underway, I am watching from my hotel in Clearwater and I can feel the energy just down the road in St. Petersburg. The first jersey I saw today was a Boston jersey though, at breakfast this morning. Red Sox fans are here in force, we even overheard some of the Red Sox fans heading down for Game 6 on our flight on Saturday morning. I assumed the Phillies would play the Rays for the World Series, this is in great doubt, and a Red Sox / Phillies matchup could easily happen as well. I would rather the Phils play the Rays, as the Red Sox have a massive following and plenty of postseason experience. The Red Sox Nation is a group of rabid fans that follow every move of the team. Not that I am worried that the Phillies would lose against the Sox, but I just don't want that "Sox Nation" to invade the Citizens Bank Park, but if the Red Sox get in, I am sure they will want to. The Rays have been the untold story of baseball in 2008, they played awesome baseball and have finally contended with the juggernaut and the titanic known as the New York Yankees, and the equally as bloated Boston Red Sox. The Rays have given baseball fans in another part of the country a reason to love baseball, and the big juggernaut teams with their overpaid payrolls have to take a second look at what is going on with the upstart Tampa Rays. The Rays suffer a little brand confusion down here in Tampa, they used to be the Devil Rays and they don't play in Tampa, but they play in St. Petersburg. So this is a little baggage that makes some baseball fans a little confused. It would be like the Phillies playing in Chester PA but still called the Philadelphia Phillies. It works for this team though, but I don't see why the city of Tampa wouldn't have a world class facility for the team that bears the city's name. Game 7 is up for grabs and the winner goes on to the World Series and the loser just goes home to watch, so a lot is at stake here tonight in Florida. Well, back to my vacation and what else, I am going back to watch game 7 it's Tampa down by 1 in the second inning at the time of this post. We share our stories for the 2008 Phillies as they move into the big games, the World Series! Join Rich Baxter and Jim Mulry as we talk Phillies baseball. Phillies Talk Podcast - The Phillies clinch live! The Phillies Talk podcast from the night that the Phillies clinch the National League Championship 2008~ Tune into and listen to this live podcast as the game went on Oct. 15 vs the LA Dodgers. The World Series is next as the Phillies quest continues! This seems like a dream, only 6 weeks ago, the Phillies were still struggling for a playoff appearance, they were wondering if they could beat out the Mets for the top spot in the NL East, and the thoughts of the World Series were just pie in the sky thoughts. All these pie in the sky thoughts have now come down to only one more win by the Phillies and they've made it to the ultimate series for them as players, a dream that many major league players who were and are great never even got to live. The Phillies have approached each series with the thought, we won't think ahead, we play each game as it comes and that has helped them deal with the series play in a great way. Now, they stand on the doorstep of record books, of memories that will last for years for the players and the fans who have waited for it. 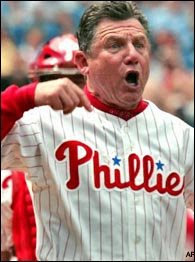 Bowa asks the Ump: 'Don't tell me those rotten Phillies are going to the World Series!" There used to be a name for a game that will go into the video vault as a great game. "Instant Classic" was the name of it, and this is what the Phillies played in on Monday night in LA against the Dodgers for Game 4. This game was like a roller coaster ride that both teams looked like they commanded at various points of the game. It was one of the most thrilling games ever for the Phillies fan. The team looked as if they would lose this one for sure, momentum went with the Dodgers until Matt Stairs sealed the deal with a homer into the starry night of the LA skies. I am so glad I didn't go to sleep on this one when I thought the Phillies were going to lose this one. Every one is second guessing Torre is this one. If Stairs struck out instead of homer, Torre is a genius and everyone is second guessing Manuel's wacky moves in this game. It's easy to sit in judgement and say if he would have done this or would have done that things would be different, but that is too easy to be an arm chair coach or GM. The facts were this was a hard fought game that the Phillies overcame what the Dodgers threw at them. End of story Phillies win. Howard needs some pointers on how to throw balls to any base that one is very clear.... he's afraid to throw a ball. I don't like it. I don't like it at all, your paying a guy 10 million and he comes up looking like a little leaguer. Rollins, Utley, and Howard should also be embarrased at what they have done in this series. The series win will be courtesy of Victorino, Ruiz, and Burrell. Let's go.. and take this rag tag team into the World Series... is this really World Series team or am I just dreaming this????????????? 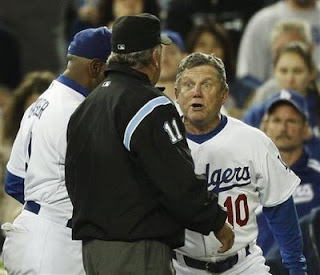 Larry Bowa is a traitor Dodger Blue Weisel may he never wear Phillies pinstripes again! Jamie Moyer went into Game 3 with an idea that he could win, and that opinion was shared by catcher, Carlos Ruiz as well. The game barely got underway and before you knew it, Jamie Moyer was down 5-0 with a flurry of hits and runs scored by the Dodgers. The game devolved into a cat fight when Dodger catcher, Russell Martin stood in the batters box and let an errant change up by Moyer plunk him in the knee. Martin was not the same player after this, and in the next inning Clay Condrey threw another misguided pitch that was high and tight on Martin and from this moment on, Martin appeared to be bent on returning the favor to the Phillies as he lined up to catch balls directly behind hitters, Rollins and Victorino. Several players were fined in the near scuffle that broke out after Shane Victorino was thrown at by Dodger pitcher, Hiroki Koruda. The throw at Victorino was enough that Korudo should have been ejected, but instead he was one of the players on the Dodgers that was fined. A little drama down in LA last night, but the end of the story found the Phillies on the short end of a 7-2 score and a score to settle tonight when the series continues. They don't need to come out and try to hit the Dodgers with baseballs, they need to get hits on the field and win a game out there in LA so they can wrap this series up either out there in LA or in Game 6 in Philly. It was funny that you had two former Phillies, Larry Bowa, and a guy that just got honored by the Phillies two weeks ago, Mariano Duncan, both whom seemed to would have liked to punch some of the Phillies lights out last night. Suddenly it looks as if these two have really showed their true colors, Dodger blue perhaps. I won't feel the same towards either one of them, and don't care much more to hear of their accomplishments with the Phillies teams they used to be on either. They showed their true colors and I think the have drawn the ire of Phillies hometown fans as well, the boo crew will be out for them for sure! We don't forget these ugly incidents that's for sure. Bring on Game 4, I am fired up and want to see more, more, more. By the way, I've been blogging with the live game chat at LAtimes.com and it's pretty cool to be chatting away to people 3000 miles away about the game in progress, pretty cool! They do the same live game chat here in the Philly area at www.philly.com, check it out. The Ground Crew for the Phillies do a great job here's to them! Game 2 NLCS just before the start of the game! The crowd at Game 2 for this NLCS game was one of the best crowds I've ever been in to watch a baseball game. The festive mood, and atmosphere around the Citizens Bank Park was electric to say the least. The fans were behind every pitch that Brett Myers threw on Friday early evening in Philadelphia. Not a moment went by practically when there wasn't action on the field. I was listening to the game on the radio as I was sitting in my seat next to my beautiful wife, and listening to the guys talk about how the Phillies have determined that they can pitch to Manny and they know how to pitch him now in certain situations. Just after they said this, Manny put one in the left field bleachers for a three run shot, I remember thinking to myself the words that I spoke in my Phillies podcast, "Don't let Manny beat you". He didn't beat us this day, but I suggest the Phillies be a little more in a hurry to walk him and pitch to someone else instead. This is one of the best playoff games that I've seen. The Phillies being in it certainly added my extra interest, but the Phillies pulled a game out of the hat tonight. Chase Utley snapped out of his Division Series funk to plant a long fly into the right field stands to get the Phillies energized for the win. Pat the Bat has been brilliant during the playoffs, he's like the elder statesman of the team and he is speaking with his bat. Good hustle on the part of the Phillies here, and a great much needed first game win after a somewhat shakey start with Manny almost going deep against Hamels and this act quieted the crowd to almost silence! Great pitching by both pitchers, Derek Lowe sort of ran out of gas there in the sixth inning, he started sweating terribly and fell apart really quickly. Hamels solidified his position as the ace of the Phillies staff, and he looked very poised on the mound. The fans went home happy tonight, and I'll be up at Game 2 on Friday afternoon to take in the happenings and I'll be sure to take some notes to post here in my blog about the game. Phillies Talk Podcast Oct 8 2008 - Manny Ramirez is "Despicable"
The Phillies Talk podcast for Oct 8 2008, Tim McCarver said it, "Manny's Despicable" in so many words today in the Philadelphia Inquirer. What did he mean by this? Listen to my podcast and see what it is all about! The Phillies vs. The LA Dodgers for all the marbles in the NLCS starting Thursday at 8:22pm! Listen to my prediction here on the only Phillies independent podcast out there! Phillies Talk with Rich Baxter. The great news of course is the Phillies made it past the Brewers in the first round of the playoffs this year. They have maintained a great attitude, that included not being too happy at what they already accomplished and they wanted to further advance and accelerate themselves into the World Series this year. Time will tell if they make it to the World Series, but if they do, this will be the team that at times struggled and other times cruised to victory this year. It would be a cinderella story that will be told for many years to come. That remains to be seen, but the Phillies have accomplished a great deal by making it this far, and that is great. 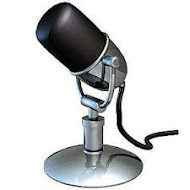 Stay tuned for my regular season Phillies review of the 2008 season podcast, here on this blog and via iTunes as well. I will be breaking down the series against the Dodgers as well, so if you have anything you would like to add please leave me a comment and I'll include it into the show! October baseball starts today for the Phillies! The first day of the postseason is upon us and the Phillies are raring to go. A lot of talk of going deeper into the playoffs this year was the topic of several of the players after the Phils clinched the division for the second straight year. The games begin today, and I hope the Phillies bring their "A" game to the field this afternoon at Citizens Bank Park. The pitching staff still concerns me for the playoffs. They haven't been a pitching staff that is easily compared to World Series caliber staffs by any means. Cole Hamels has been strong all year, but he hasn't exactly been Cy Young and has been prone to being close to imploding a couple times during games down the stretch. He's not Steve Carlton that is for sure, not yet anyway. That being said, the Phillies do have what it takes to win this series, the Brewers are no team to be taken lightly though. They have a dangerous line up of players that aren't household names but they get the job done on the baseball field. The Brewers have their 'unsecret' weapon in CC Sabathia, and the Phils need to do all they can do to win both home games so they go into Milwaukee without too many worries. The Phillies offense is more than capable to do the job, yes we've seen them even get into a fog and it seemed at times that the team couldn't hit their way out of a paper bag, but this is all behind them now, and they need to let the legend of this team shine through and take a piece of the pie in this postseason. I'll be at the game today and I'll relay what I saw in my next post, so let's hope the Phillies end up on the winning side of today's game and hopefully the team is well on it's way to the NLCS next!